UK employees are so "email-obsessed" that nearly half of them plan to check their work messages over the Christmas break, according to a survey. Security firm Securenvoy's study suggests that staff in the 18-24 year old bracket are most inclined to look at their emails over the holidays. The study questioned 1,000 people in full-time work. The firm said that the email-checkers were likely to be those most worried about losing their jobs. It said those over 50 appeared less concerned about staying in touch than those who were younger. Of those surveyed, 31% said they planned to look at their work emails intermittently over Christmas, while a further 15% intended to check them frequently. One in five of those questioned said they would feel "competitively disadvantaged" if they did not keep on top of their messages over the festivities. By contrast, 34% said that they had no intention of checking their electronic mail. Experts agree that those in their twenties have become addicted to online communication, but question Securenvoy's conclusions. "The younger generation is more digitally connected than its older peers," Vanessa Robinson, head of HR practice development at the Chartered Institute of Personnel and Development, told the BBC. "But they will probably also be checking their Facebook and other online communication systems over the holiday period. They may just wish to be connected to work, not because they are insecure but just because they wish to feel as if they are still informed." 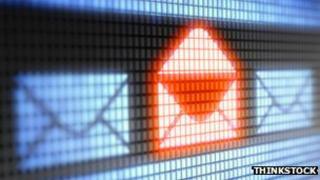 The study follows a decision by Atos, the French IT services giant, to scrap internal emails at the business by 2014. The firm's chief executive, Thierry Breton, told the BBCthat his employees were wasting hours of their time, both at home and work, because most of the messages were not useful. Even so, he said, the workers were worried about missing something important. The company is already carrying out trials of instant messaging tools and other alternatives to email. However, Atos will continue to use email to communicate with other companies and clients. Research by The Work Foundation think tank also suggests that electronic messages are infringing on workers' private lives. It suggests that about two thirds of all employees feel the urge to respond to emails immediately as they come through, with over a third of all workers checking emails at least every 15 minutes on their PC, smartphone or tablet computer. "While some employees may in fact prefer to work flexibly, so as to have time off in lieu just when they need it, for others unpredictable working hours present a significant strain on their work-life balance, for example, when having to meet childcare responsibilities," said The Work Foundation researcher Ksenia Zheltoukhova. "Organisations have to be clear on when and how often their workers are expected to be available online, and maintain a balance of the employer-employee relationship. "If the demands that employers place on the individuals systematically outweigh what employees get in return, such 'deals' will be not sustainable for long, even within a tough labour market." But others stress that, used correctly, email may prove less burdensome than telephone calls or other forms of communication that require both parties to be available at the same time. "There is no doubt that you get a lot of email that is not necessarily what you want or need," said Vanessa Robinson. "However, in big organisations people work in different time zones and often speak different languages. So access to non-immediate communication systems, such as email, can help keep messages clear and prevent the staff from working unsocial hours." Why can't everyone just work from home? Has mobile working come of age? Should employees buy their own computers?